The iPad is pretty great for photographers, but in typical Apple fashion, if you want to really use the device then you keep knocking up against crazy and annoying limits. The most obvious of these is probably the whole iPhoto/iPhoto problem: two apps, for Mac an iOS, that share a name but little else. They certainly don’t share their photos. At some point, you’ll fill up your iPhone with pictures. The only ways around this are to delete pictures to free up space, or to copy the pictures to your computer and then delete them fro the iPhone. For all of Apple’s post-PC future, you still need a whole computer for what amounts to offline storage. What if Time Machine came to iOS7? Your iPhone and iPad could talk to your Time Capsule, or to any USB drive connected to your Airport Extreme router, and backup your images. Even better, it could leave small, lower-resolution previews on your iPhone (via iCloud, so they’re available to all your devices at any time). Built-in Eye-Fi support? Yes please! 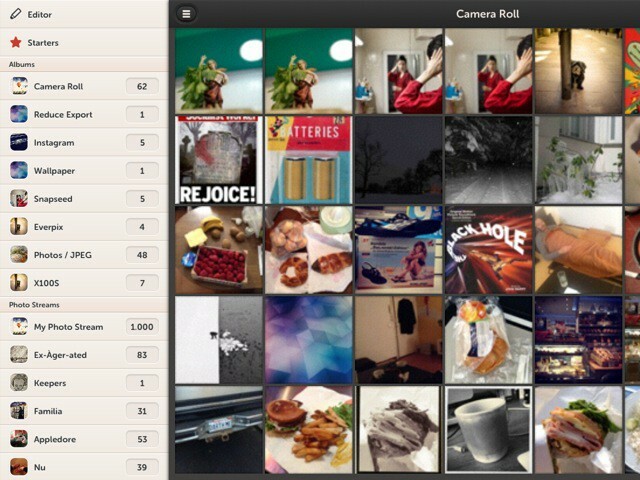 Eye-fi cards are undoubtedly useful, but they’re also terrible to use with iOS devices. What if iOS7 brought native support into the iPad? Plugging the crd in via the camera connection kit would pair the two devices, and then you’d be good. 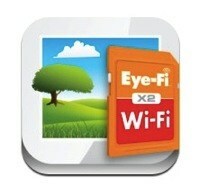 The iPad would detect the Eye-Fi’s self-made network automatically and grab pictures in the background. Bonus points for a neat shared Photo Stream-style thumbnail preview in the lock screen. Currently iOS can handle RAW files from your camera, but it only stores them, using the embedded JPG preview (provided y the camera) for viewing and editing. If you shoot RAW+JPG on your camera, then it’ll use the better-quality JPG, but it’ll still leave the RAW file untouched (the RAWs are sent to your Photo Stream, though). If you’re on vacation, then this could fill your iPad up pretty fast. I typically shoot RAW+JPG when traveling so I can have high-quality files to share and edit, and the RAW “negatives” to further tweak in Lightroom when I get home. What if iOS7 let you import just the JPG files, leaving the RAW ones on the SD card. Later, back at home, you could merge the two together again on the Mac. This requires that you carry a stack of SD cards with you on a trip, but if you’re interested in this feature at all then you probably already do that. Locationgate robbed us of a valuable photographic resource. One of the best things about taking pictures with the iPhone is the GPS location tagging. I’m so hooked that I now carry a little GPS dongle with me whenever I leave the house with my camera, so I can use Lightroom to marry the resulting GPX file with my photos back at the Mac. But what if iOS could do this for you? Remember Locationgate, the “scandal” where the iPhone kept a record of your meanderings in its bowels and some hackers managed to dig that file out of your iTunes backups? That file is still there, but excluded form backups and with less data (a couple days instead of two weeks, is my understanding). What if iOS7 used this file to (optionally) tag any imported photos with GPS data? The beauty of this method is that you wouldn’t need to run a battery-sucking GPS app all the time, nor would you need to remember to switch that app on and off to use it. The built-in location record is less accurate (I believe it’s mostly based on cell-tower positioning) but that would be enough for most people. If you want greater accuracy, use regular GPS just like you can now. The beauty of iOS for photographers is the abundance of small, cheap, single-serve apps in the App Store. But the flipside of this is that you almost always have to save the edited images back to your camera roll before opening them in another app. Open in could do with a Dropbox entry. Most apps offer an “Open in…” option, but this often omits lots of the metadata in an image (sending a photo direct to Instagram strips location data, for example). So in practice we end up with duplicate images, or at least several versions of an image, which isn’t ideal on a space-constrained device. This way, you would have just two versions, no matter how many steps you take in editing: original and edited. IOS7 could even stack them together to keep things tidy.What if iOS7 could round-trip a photo between apps, keeping track of it along the way? All metadata would go along for the ride, with apps adding more as needed. And the originating app (likely the Photos app) would provide a fallback if something went wrong (an app might crash, so the last-good version of the photo in the chain would be returned to your Camera Roll). I really like iPhoto for iOS. It’s way better than the Mac version, and useful as an editor and as an organizer. But this makes its flaws even more annoying. Speaking of syncing, iOS would benefit from multi-source syncing. That is, it would be able to sync not just with iPhoto, but with other apps. The best option for users would be plugins that let it play nice with apps like Lightroom and so on, but failing that a simple folder sync would be great. Right now you need to choose between iPhoto or folders (using iTunes syncing). I want both, simultaneously. 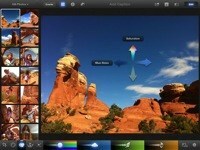 iPhoto should also write to Photo Stream. Currently you need to save your pictures to the camera roll, whereupon they are picked up and sent to Photo Stream. Then you have to delete these pictures again. This is annoying for you and me, but worse for our families. I share Photo Streams with most of my family members, but when I put together collections in iPhoto for iOS, I have to share Journals. This means that the recipient has to remember where to look to see the pictures. Journals should be rolled into Photo Stream and be done. Photo Stream is great (when it works) for backing up photos and for sharing them. I’d like to see two-way shared streams, though. Currently I can publish a stream and my friends can subscribe. I want them to be able to add photos back and share them with me. Also, if I add a photo to a shared Photo Stream, currently it is added back on my Mac (in iPhoto). But it uses the low-res version of the picture that iCloud sends to all iOS devices. I want it to use the high0res version it already has, This seems like a small thing, and it probably is. But it would mean that you could make albums and portfolios on the iPad and have the reference version on your Mac, ready for printing books or whatever. Apple is slowly letting third-party services into its den – Flickr, Twitter, The Face Book – so I’d like to see Dropbox support, in iPhoto at least. Because of the disconnect between the Photos app and iPhoto for iOS, I can’t just let Dropbox back up my iPhoto the way it can upload my Camera Roll. What if iOS7 let me export to Dropbox right from the “Open In…” dialog? You can do this now – even in iPhoto – but it’s just one picture at a time, and you have to manually choose where to save it. Every. Single. Time. I’d also love an option to use Dropbox as a source when opening images, but that’s both unlikely and less urgent: typically you only want to open one picture at a time, and that works just fine with third-party apps. ICloud is fine for sync, but for actually moving things around, Dropbox is way better. When Dropbox Albums finally comes to iOS, this might all be moot anyway. That’s how you do a photo picker. Repix. 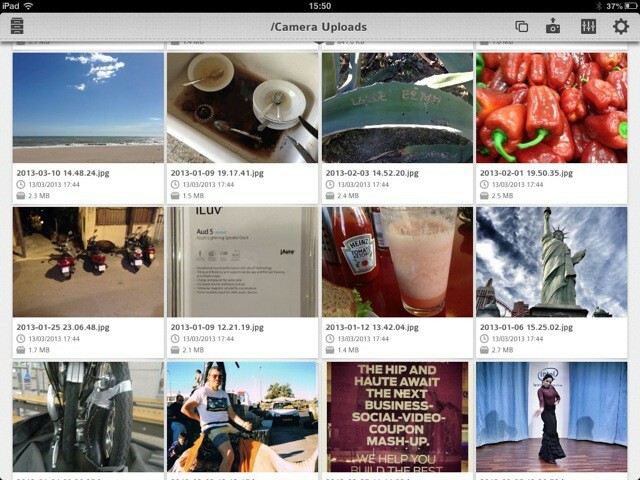 Last but not least is the native Photos app. It does an OK job, but it could do so much more. To begin with, I’d like to be able to sort images not only by date added (the only option currently) but by size, date captured, kind and so on. And what about metadata? Just to check the file name I need to go to another app (iPhoto, for instance). Also, photo selection is horrible. To delete a whole folder of pictures I need to open that folder, enter edit mode and tap each picture, one by one. If anything goes wrong in the meantime, I need to start over. There’s one shortcut – tap and hold a picture with two fingers, then slide those fingers over other pictures to select them – but this barely works on the full-sized iPad, let alone the mini. What about a better photo picker? The current iPad photo picker is little more than a full-screen iPhone picker in a popover. Many apps, including Adobe’s Photoshop Touch (Adobe! ), do this better, and full-screen to boot. And while we’re making wishes, what about Flickr and Facebook photo integration? I’d like to see my Flickr photos right there in the Photos app, and share them from the same app, too. 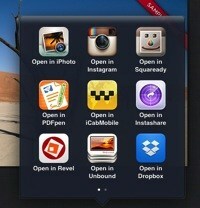 Apple already does comments and sharing in Photo Streams, so why not add other services? Especially as both are already included in iOS to some extent. IOS is already a great place for keeping and sharing photos, but by fixing a few little frustrations it could be a whole lot better. Some of them seem like obvious fixes – better iPhoto-to-iPhoto sharing, for example – as they would benefit the vanilla mainstream user that it the present-day Apple customer. But I like to thing that the nerds who work at Apple still add little tweaks and tricks to scratch their own itches. If you’re reading this, Apple engineers, then pretty please, please add some of these features!